BRAZIL – Demonstrations against rising costs of public transport and 2014 World Cup reflect anger over government policies. Yesterday, Jun3 17th, over 100,000 young protesters have massed across Brazil to demonstrate against the rising costs of both public transport and the 2014 World Cup to be held in the country. Protesters gathered in at least seven cities on Monday in what they hoped would be their biggest demonstrations yet against the increase in transit rates. The protest movement is mainly made up of the middle class and is critical of the government’s decision to increase transit rates by 10 cents, to $1.60. 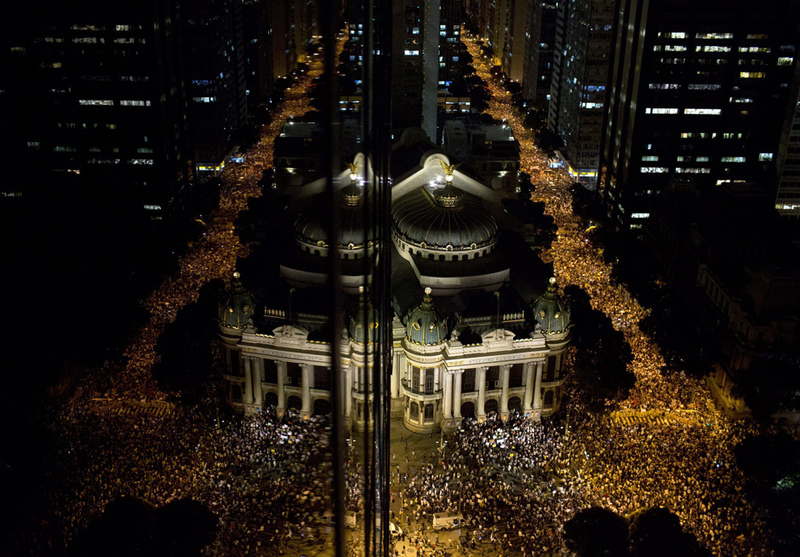 Police in Sao Paulo estimated that 30,000 people rallied in the city’s biggest demonstration yet. Up to 20,000 people marched in Rio de Janeiro and another 6,000 took part in protests in the capital Brasilia. Brazilians have long accepted malfeasance as a cost of doing business, whether in business or receiving public services. The government loses more than $47bn each year to undeclared tax revenue, vanished public money and other widespread corruption, according to the Federation of Industries of Sao Paulo business group. But in the last decade, about 40 million Brazilians have moved into the middle class and they have begun to demand more from government. While almost one-fifth of the population lives in poverty, many Brazilians are angry that billions of dollars in public funds are being spent to host the 2014 World Cup and 2016 Olympics while few improvements are made elsewhere.